Lennard’s Latevia Hall, #2, shoots free throw in victory over Durant 31-28 on Jan. 24. For Coach Mcwhorter’s Longhorns, #1 is Mikalia Harrison and #10 is Mara Johnson. 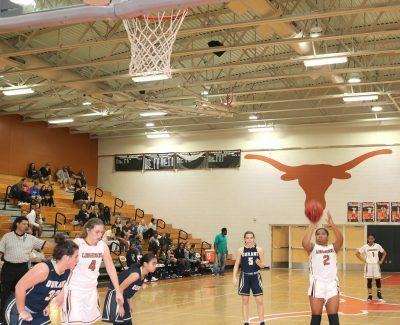 RUSKIN — The Lennard Lady Longhorns led by Coach Jerome Mcwhorter will complete their regular season this week with non-conference games against powerful Robinson, 15-2, on Jan. 28 and at weak Leto, 2-16, on Jan. 29. Mcwhorter is in his second year as head coach. Last season the Lady Longhorns went 11-9 before experiencing a long streak of hapless seasons. 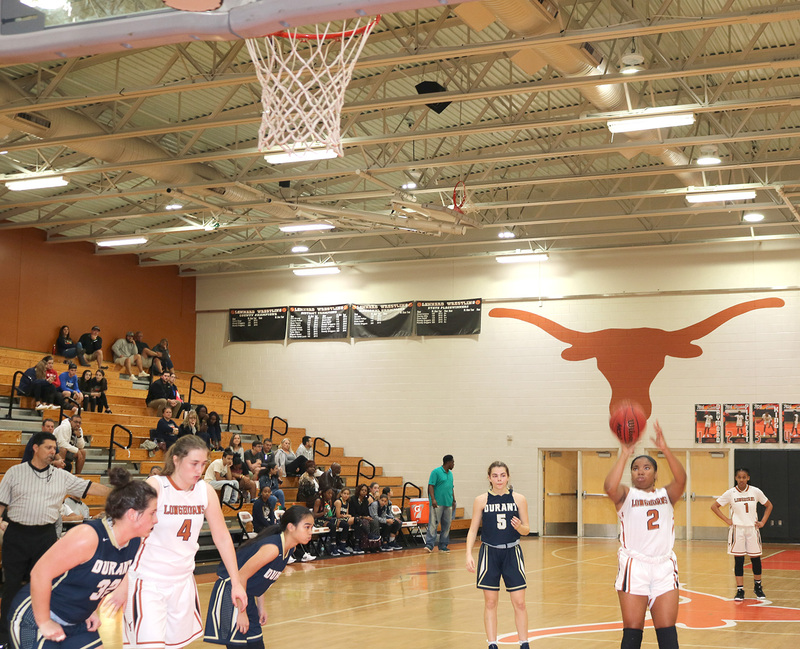 Previous to those two games before press time, the Longhorns sported a 8-16 record overall and finished 4-7 in 8A District 9, tied with Durant in fourth place in a seven-team conference dominated by first-place Tampa Bay Tech, which was 21-3 overall and 12-0 in District 9. Last week the surprising Longhorns beat East Bay 51-44. On Jan. 24, the girls’ varsity took the measure of Durant 31-28 before falling to Bloomingdale 32-31 in a heartbreaking loss Jan. 25. According to Mcwhorter, coming into this season the Longhorns had three returning players and eight players who had never played in a high school basketball game. Mcwhorter is grooming freshman Halei Murrell to replace Hall as team leader with all the talent Murrell brings to the floor. The Lady Longhorns next year will have four other outstanding players to build its season around: Mikailia Harrison, Mara Johnson, Imani McFarland and Hannah Feuerbach.